I wrote about the idea for Apple Park in my last blog - the definition of extending some of the technology we are seeing in parking lots to reduce the amount of driving around wasting time and gas trying to locate the open parking spots in a large parking garage. When you first drive in you see an e-sign that tells you how many free parking spots are remaining, which pretty well, as long it's more than zero, doesn't say much. At this point the driver's question is - where are they and which way do I turn to get there? 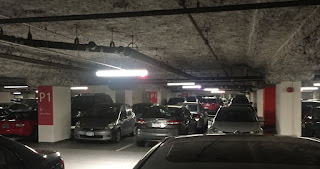 This is the first indication of the library lot's poor design - the designers decided to put the red/green availability lights into the actual fixtures that illuminate the parking rows. They are very hard to see since they're in the same fixture as the bright white fluorescent (see photo below). In a parking lot with neat orderly rows they might be more useful, but this parking lot has all kinds of strange angles and angular spots to park. The empty/full indicator is that red light at the end of the bright fluorescent fixture. See it? But the real mystery of this design comes from a very odd decision. In this picture you can see that they went through the time and expense to install conduit to every parking spot, and an ultrasonic distance sensor over every parking spot. every parking spot has an overhead ultrasonic sensor, but no LED! Now, of course you have to do this to make an automated free-parking spot tracker, but why, having spent the time and money to put the sensor over every parking spot, would you not put a $0.10 Red/Green LED to show the driver where the actual empty spots are? Instead, if you can even see a green light in the glare of the overhead fluorescents, they pretty well tell you "yes, there is a free parking spot somewhere in this vicinity." In the VPL lot however, because of the strange angles, you can drive to a green light and not be able to see the open parking spot, since it might be around a corner. It's always interesting to see a bad implementation of something to be so instructive, it's just frustrating to know that after what must have been a considerable expense, the utility of the solution is probably quite poor for that single design error. Posted by Dave Kauffman at 3:55 p.m.